Protect your data and privacy. With so much of modern life taking place online, and increasingly monitored by powerful third parties or hackers, it’s very important to ensure that your data and activities remain private when you use public Wi-Fi. Norton Secure VPN Privacy aims to do just that, employing bank-grade security encryption and VPN technology to keep prying eyes at bay. We explore what it does and why you should be using it on your Mac, PC, or mobile device. What is Norton Secure VPN? 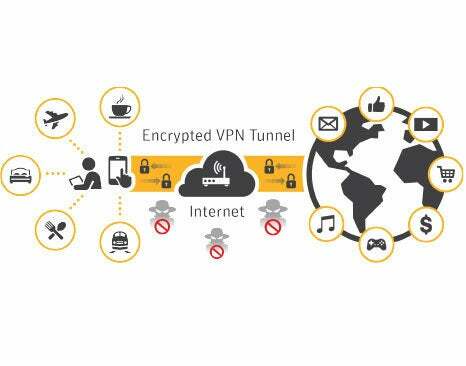 Norton Secure VPN creates an encrypted tunnel to shield you. Whenever you use public WiFi connections like those found in coffee shops, airports, or hotels you’re taking a big risk. Hackers target these particular types of networks, using techniques such as man-in-the-middle attacks that intercept information sent between your device and the server, or exploiting vulnerabilities to directly upload malware onto your system. Norton Secure VPN Privacy helps put a stop to this by creating a Virtual Private Network or VPN. A virtual private network gives you online privacy and anonymity by creating a private network from a public Internet connection. With Norton Secure VPN, all of the most sensitive data that you send and receive from your device like passwords and credit card numbers are encrypted and converted into unreadable, untraceable data until it reaches Norton servers. While the idea of setting up a Virtual Private Network might sound complicated, Norton Secure VPN Privacy keeps things simple. When you launch the app, it gives you the option to turn on the VPN. Doing so automatically creates a private network using the public WiFi. You’ll see this is working when the small map showing your location changes from red with the words ‘Unsecured Connection’ underneath to green and ‘Secured Connection’. That’s it. No fiddling with network settings or proxy servers. Now you can search the web with your normal browser, use online banking, access and send sensitive data, all in the knowledge that you’re protected by the same encryption technologies used by the major banks. Norton Secure VPN helps keep your online identity and activity anonymous when you use the Web. Norton Secure VPN is a no-log VPN that encrypts your personal information and doesn’t track or store your online activity or location. Along with maintaining your privacy, the app has a couple of other very useful features. The first prevents ad-trackers from using cookies to follow you around the web and continually serve annoying ads. The other is masking your IP address and location. By using servers around the globe, the VPN allows you a personalized browsing experience. The VPN helps protect your online privacy by blocking intrusive activities like tracking or controlling your online activities or location by Internet service providers, mobile carriers, advertisers, and websites. Setting your location is easy. Just open the app, select the Virtual Location tab, then choose the country you want. Norton Secure VPN Security will reroute your connection in seconds. When you’re finished, simply revisit the tab and select your home nation once more. Norton Secure VPN may be used on one, five, or ten Windows PCs, Macs, iOS, and Android devices, with unlimited use during the subscription term. For one device it's $4.99 per month (plus applicable taxes) or $39.99 per year (plus applicable taxes). Terms apply. Move to five and your monthly amount goes up to $7.99 per month (plus applicable taxes), while yearly cost remains the same. This makes it a great choice if you want to protect your laptop, desktop, tablet, and smartphone. Families can opt for a ten-device tier which costs $9.99 per month (plus applicable taxes) or $59.99 per year (plus applicable taxes). There are also bundle deals that combine Norton’s WiFi Privacy and Security software, beginning at $69.98 per year (plus applicable taxes) for one device and going up to $94.98 per year (plus applicable taxes) for ten devices. Protecting yourself from the increasingly sophisticated online threats around today is a regrettable necessity. Thankfully, Norton Secure VPN Privacy makes this daunting task easy due to its clean and understandable interface. With no real setup required users can quickly find themselves browsing safely and anonymously from their phone, tablet, or PC. The ability to change server locations opens up a literal world of online content, while having ad-tracking efforts blocked at the same time is a useful side-benefit. Norton’s wide range of subscription tiers means there are packages for everyone, from securing your phone to all your devices, and at prices that suit any pocket. We’d say it will be money well spent.